The S6 is a proven quality guitar with great price. Big looks, sound and attitude from the Rancid frontman’s signature acoustic. Guitar worthy of being named after the birthplace of Country Music. 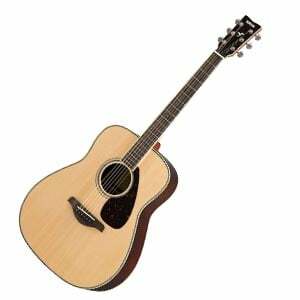 Yamaha’s FG series is among the oldest and most popular acoustic guitar lines ever made. As a matter of fact, FG was the most sold acoustic guitar in the world at one point, that’s a pretty awesome feat. Yamaha has evolved their manufacturing process for the FG several times since the first one was released back in the mid-’60s. Today, these guitars are built using a fusion of decades-old experience and robotics. When you look at the specs sheet for Yamaha FG830, it appears to be just your average entry level acoustic guitar, but it’s a bit more interesting than that. Nothing beats a solid Sitka Spruce top. But when you are Rosewood back and sides, this Yamaha starts looking like a much more expensive piece the closer you get. The shape is your standard Dreadnought, which just so happens to be among the most popular body styles at the moment. The neck and its profile are pretty comfortable, and rather smooth for an acoustic in this price range. This guitar comes with die-cast tuners and a nice Rosewood bridge. While it’s not the prettiest bridge in the world, this Yamaha design gets the job done just fine. One thing that really puts the FG830 in perspective is the specially designed bracing. Yamaha utilized their unique software to figure out what bracing pattern would work the best based on all of the materials and dimensions on this guitar. Needless to say, they’ve struck gold. With all that said, we need to emphasize that this is still a production acoustic guitar. This means that some work might be necessary once you get it. A proper intonation and setup are two things luthiers still do better than machines, and that is probably not going to change anytime soon. Just be ready for the possibility that you might have to pay a visit to your local guitar tech for some hardware tuning. While looks affordable, and feels that way to a certain extent as well, Yamaha FG830 definitely doesn’t sound cheap. There’s a lot of that typical Dreadnought sound going on, but the core of its tone is pure quality. Rich projection combined with a lot of overtones make this Yamaha a force to reckon with in this price range, that is for certain. One of the biggest fears about this model was the amount of sustain it offered. Thankfully, those concerns were eliminated when the guitar launched. Whether you’re a beginner, or someone looking for a beater guitar to play instead of our tier one acoustics, Yamaha FG830 will keep with your requirements. Overall, we have to add that the sonic impact – which is arguably the most important aspect of any guitar – has managed to pleasantly surprise us, and that is always a good thing. Good job, folks! Considering how long FG series has been around, it’s no wonder that Yamaha delivered one more great successor to this family. By utilizing some pretty advanced tech, they’ve managed to lift an entry level guitar to a whole new level. While it definitely has some limitations, Yamaha FG830 is a formidable contestant to just about any challenge you can find within the same price range, and a bit above it as well. For more info about the Yamaha FG830, click here. The Yamaha FG830 is a best-in-class guitar in the $300 price range. It is easy to play and the sound projection is near perfect. It did need an initial set-up, but that is the norm for most guitars that cost below $1,000. I have played FGs since the early 1970s and the 830 is the best yet. I recently bought a FG830 while on 2mths visit in China. I wanted a jamming guitar and bought this model as I was impressed with its looks, finish and tone and price. Yep, I needed to do a Minor set up… not unhappy about that and now its a great music companion. Spoiling the party can have it’s consequences, just purchased a FG 830..
I’m impressed. Yes it’s made in china, I have to give credit where credit is due. This puppy is pretty, fit and finish is right up there, the nooks and cranny are dang near perfect. I’ll get to the sound. The nut and bridge is composite, good but ? What size nut and bridge did you buy mate? I’m looking to do the same thing. Im a newby I might add. Andy…I recommend looking up Bob Colosi, who makes high quality bone nuts and saddles, as well as bridge pins. He has his own website, and if you email him he will be brutally honest with you…even if it costs him a sale. On the Yamaha (I have a FG830) he says all he would replace is the saddle to a bone model. He said you will get very little if any sonic improvement replacing the nut and bridge pins.